The CPMR was represented by Mr Mohamed Sadiki, Vice-President of the CPMR InterMediterranean Commission, Regional Councilor of Rabat-Salé-Kénitra, and Mayor of Rabat, at the Climate Chance Summit on 13 September in Agadir. 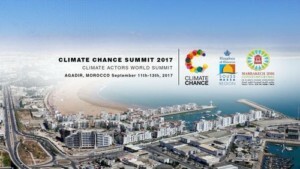 Organised by Climate Chance and the Souss-Massa region, the Summit offered participants the opportunity to share views on initiatives undertaken by non-state actors, particularly the regions, in the fight against climate change. Mr Mohamed Sadiki was invited to participate in an Oceans exchange organised with the Oceans and Climate Platform. During the discussion, he highlighted clear examples of the negative impact climate change is having on the coastal environment and the initiatives taken by the Regions to develop adaptation strategies. He also referred to the development of a CPMR policy position on adaptation to climate change, which is being developed by the CPMR Climate Task Force. The CPMR is working with many regions committed to combating climate change in coastal areas, in particular with the Charter of Bologna in the Mediterranean. The CPMR will continue its work in this important area, particularly through collaborations with regions implementing initiatives on the ground. It will also work with the Oceans and Climate Platform in preparation for COP 23.